Mazi Chidi Chimdiya Anyahuru the coordinator of Powerline Alaoji in Aba Biafra land today, was given the last earthly respect at his home town Apu Na Ekpu Umuolisa village in Isiala Ngwa North Biafra land. Indigenous people of Biafra IPOB world wide, especially Abia State sponsored the funeral and also massively stormed the home town of the deceased. Mazi Chimdiya died on 3rd December 2018 after a brief illness. He is 56 years old leaving behind his wife and children. 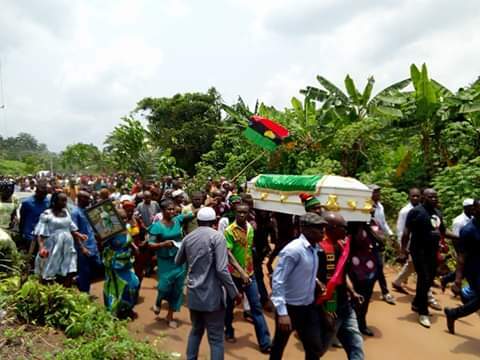 The funeral was a success with the presence of IPOB Biafra land and Abia State Coordinator Mazi Ikechukwu Ugwoha, his deputy Mazi Sopuruchi Ochiulor, the three Abia senitorial coordinators, the 17 local governments coordinators and various zonal and unit cordinators and their members. With same magnitude, IPOB carried out a brief evangelism led by Mazi Ikechukwu Ugwoha round the village to also senitise the people in community over the need to join the struggle to restore Biafra. It was a peaceful and mind sounding event and IPOB in general, thank Chiukwu-Okike-Abiama for his grace and safe journey he granted our members who came from near and far. We also thank the creator for a successful funeral of our beloved Biafran soldier and brother . Nwada Ugochinyere Reports for Umuchiukwu Writers.